With over 12 years’ experience working with and advising private clients, Tom leads our UK Philanthropy services to help clients identify and achieve their philanthropic and impact investing strategies. 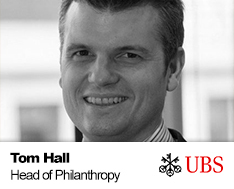 Prior to joining UBS in 2013, Tom spent his career in the non-profit sector working with wealthy individuals and companies to deliver award winning, sustainable philanthropic and social investment solutions. As Director of Philanthropy and Social Investment at the disability charity Scope, he pioneered the use of social investment structures, including the Scope Bond which was the first listed bond issued by an operational charity in the UK. Tom also worked with the cabinet office on the development of the new Social Investment Tax Relief. Earlier in his career, Tom was the first UK employee of the Microloan Foundation securing the investment for the charity to expand into sustainable microfinance business reaching over 20,000 clients a year in Malawi and Zambia. Tom is a Politics graduate from Exeter University and has professional qualifications in marketing (CIM), fundraising management and financial planning.